Specially formulated for wood panels, this ready-to-use, premium ground gesso interacts with paint, creating a responsive surface that completely seals and prepares the panel. Spreads quickly and evenly, dries fast, won't crack or leave air bubbles. This gesso is specifically formulated for use on rigid painting surfaces, such as Art Boards Natural Fiber and Natural Maple Panels. 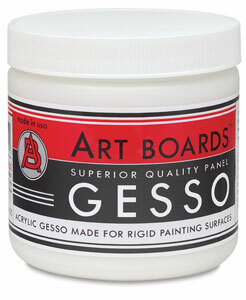 It is the only acrylic gesso that performs like traditional gesso on these surfaces.